We hope your first month of the New Year kicked off with a bang and your year is already off to a great start. Once the holiday festivities come to a close, many people decide to reflect on what they can improve on for the year that lays ahead and set New Year’s resolutions to make this new year even better than the previous one. 2018 saw many changes for DPM, as our company continued to grow and the projects we are involved in are increasingly becoming larger in scale. It is an exciting place to begin 2019 in! Our new fourth floor office is running in full swing, and we have continued to add new faces to our team in the first month of 2019. We are working hard to make this the best year yet and are anticipating amazing things to come! 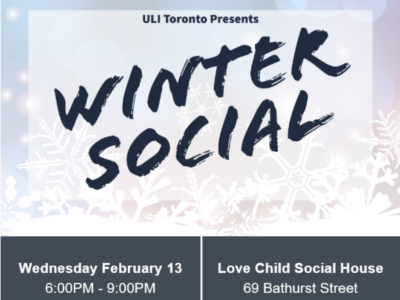 On February 13th, DPM is proud to sponsor the Urban Land Institute’s (ULI) Winter Social at Love Child Social House. Come join us for an evening of networking in one of Toronto’s coolest new spaces.